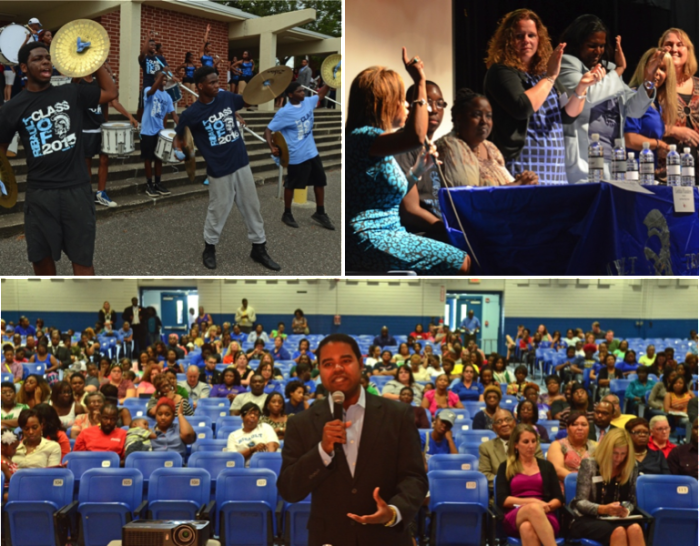 To engage the community surrounding the 36 schools that are the focus of the Quality Education for All Fund investments, Duval County Public Schools hosted three meetings at Andrew Jackson, William Raines and Jean Ribault high schools. The new Duval Transformation Office coordinated the events, held on July 28, July 31 and August 4. The marching bands and spirit squads from each high school greeted attendees as they entered the auditorium. The program began with the Duval County School Board members who represent citizens in the area: District 4 representative Paula Wright at Jackson and Ribault and District 5 representative Connie Hall at Raines. Following their welcome, parents, students, teachers and community members in the meeting heard directly from Superintendent Nikolai Vitti on the details of how the QEA Fund came into existence and why it will focus on these three feeder patterns, as well as specifics on the investments to be made. The presentation led directly into a panel discussion with a diverse group of speakers chosen to give their perspective on QEA will impact their school, community and city. Each panel had a representative from the school’s SAC and PTA, a teacher from the school, a student from the school, a QEA Advisory Board member, a member of The Community Foundation staff and the region chief for the entire Duval Transformation Office, Iranetta Wright. Moderated by Trey Csar, President of the Jacksonville Public Education Fund, and Torin Dailey, Vice Chair of the Jacksonville Public Education Fund Board of Directors, the panels gave the audience a variety of perspectives on what the QEA Fund investments will made in the DTO schools. Audience members then had a chance to ask questions about the implementation and intended impact of the initiative. Parents, caregivers and community members shared their enthusiasm about this new approach to reform in the Raines, Ribault and Jackson feeder patterns. Many voiced the need for the community to do its part to ensure that the program is successful. The event ended with raffle giveaways and food from the local Red’s Food Truck. These are the first of what will be many meetings and events geared towards engaging the communities that surround the Transformation region.